Our capabilites allow you to bring a car for cleaning, qualification, interior lining, exterior paint, mechanical repair, inspection and testing. Quality control is the key to a successful painting and coating operation. Control starts with a 25,000 square foot facility that is the finest today. We expect to do things on time, with a quality outcome and we take pride in that. We perform all repairs in-house making it simple for you. Where I come from, an honest day’s work is worth an honest day’s pay. A person’s word is priceless, and a firm handshake speaks volumes about an individual’s character. As owner of Midwest Railcar Repair, Inc. in Corson, SD, I rely on those ideals every day. The folks around me understand the value of hard work. They know what it means to keep a promise, and a handshake is like a biding promise. 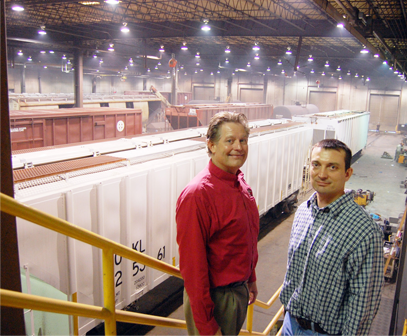 This philosophy is at the heart of the success of Midwest Railcar Repair, Inc. We’ve spent almost a half century servicing the railroad industry – repairing, maintaining and upgrading railcars – keeping an entire industry on track. Keeping you on track.